With multiple children working on multiple projects in multiple subjects all at the same time in a home that still needs to function for meals, laundry, hobbies, and hospitality, homeschooling has the potential to make a colossal mess. Of course, differing styles of homeschool will produce differing amounts of mess, and depending on where in your home you teach and work, the mess may be contained to one room, or it may be spread across every square inch! Yes, homeschooling is a lifestyle that affects every area of your life. You are not only investing vast amounts of time to teaching your children, you are also investing large amounts of your home to it too. What can you do to simplify and to organize the ‘stuff’ aspect of homeschooling? The papers, text books, pencils, work-in-progress…what is a homeschooling family to do? There are as many ways to organize your homeschool as there are methods to homeschool. Clearly, you will need to consider your tolerance level for clutter and visible homeschool accessories. How else does your home get used during the week? Is it functional to have the homeschooling gear out on display, or will you need it to be ‘invisible’ for part of the week? Some families love to have the enormous world map proudly hung in their dining room. Some prefer to keep obvious school items out of sight depending on how else those spaces are being used between lessons. You will also need to consider the square footage of your home. Maybe you have a space that can be a designated school room. Maybe you are all working at the kitchen table and sprawling out across living room sofas. Another consideration is budget: are you able to make a trip to IKEA and get colour-coordinated baskets, shelves, and desk organizers, or are you finding treasures at garage sales and creating stunning DIY projects out of repurposed items? And then you need to consider curriculum and homeschooling style. What materials are must-haves for your work space? Do your children need a TV and DVD player or large computer screen to use the CD-Rom curriculum? Will they need a chalkboard or whiteboard? Will you need space for the ubiquitous world map? Or is your school very literature-driven so that all you need are some soft places to lounge and read? However, you answer those considerations, it is good to remember that even the most laidback of teaching styles benefit from some measure of structured organizational system. You do need a system for keeping track of that growing stack of library books. You will have an easier time getting your school day started if everyone can quickly find a pencil and notebook when it is time to begin. For inspiration on how you could organize your space, regardless of how big or small it may be, check out the homeschool spaces on the 7th Annual ‘Not’ Back-to-School blog hop. They have a whole series of posts from homeschooling moms who have sent in photos and descriptions of their homeschooling spaces. Do not be discouraged or jealous when you look at some of these posts! Every homeschool is different and not all of these posts will be useful to each of us. However, there are some great ideas of how to create a space, how to free up a shelf, or how to maximize storage options so that the corralling and managing of homeschool supplies does not get in the way of simply teaching our kids. And of course, there is always Pinterest! Again, you will find small ideas like using jars and baskets, creating labels, and colour-coding shelves, and big ideas like installing countertops, knocking out walls, and painting entire rooms with chalkboard paint! As this new school year is about to begin, start right away to put into practice the new organizational habits you want to utilize and get your kids on board to help you. If mom is the only one who knows where everything goes at the end of the day, then mom is the only one who will ever do the work of cleaning up! Get the kids involved: if they have ideas of how to organize the space it will help them to take ownership of their own materials which will both lighten your load and teach them responsibility. Win-win! 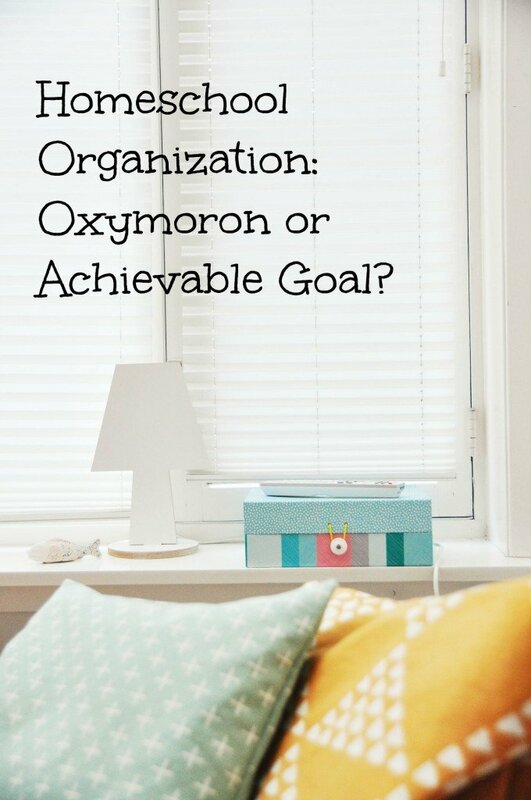 How do you organize your homeschool? What does your space look like? Are you a ‘dining room’ homeschooler, or do you have a designated space? While it is inspiring to see these pictures of homeschool rooms from the internet, we’d love to hear about YOUR space (and see it too if you are willing to send in a picture!). However you choose to organize your homeschool, HSLDA wants to encourage you as you start this year well! Keep up the great work!